Welcome to the website introducing Slovakia, country small in its surface area, but great with its attractions! Come and learn about this lovely country in the heart of Europe. Your age or length of stay does not matter – it is always worth coming to Slovak Republic. Come and see the greatest treasures of our cultural and natural heritage filed with the UNESCO list. Discover the tops of High Tatras, the unique beauty of underground caverns, diverse nature overflowing with colours in each of the four seasons. Examine the healing powers of thermal springs in Slovak spas, wellness facilities and entertaining water parks. Set out for a journey to discover new culture, to enjoy sports in winter and summer, to have a great time and on the way gather new knowledge. We invite you for a shopping spree, to taste the great Slovak cuisine and excellent Slovak beer or quality Slovak wines. We also hope that because of our effort you will be longing to visit and see this beautiful country in the middle of Europe again. Slovak Republic is the official name, but the geographical centre of Europe is mostly known just as Slovakia (or Slovensko in Slovak language). The republic was established on 1st of January 1993 after Czechoslovakia split into two countries – Czech Republic and Slovakia. Since then, the political system in both countries is parliamentary democracy and the first day of the year became a national holiday. Slovak Republic as the smaller country from the two was the one which had to adopt new state symbols. The former communist country went through deep social changes and huge economic reforms when it had to transform the centrally planned economy to a market-driven economy. The Slovak economic transition is usually said as very successful (sometimes as the most successful of all post-communist countries), eventhough especially in the 90’s it was a very hard process. In the meantime, Slovakia is one of the best emerging markets in Europe and it is a member of many international organizations including European Union, NATO, OECD, WTO, UNESCO and INTERPOL. Slovak Republic has a high average GDP growth, that is why it is called the Central European Tiger or the Tatra Tiger. The cheaper, well-educated labour force, low tax rates (20% flat rate tax) and stable economy with Euro as its official currency, attracts a lot of foreign investments. 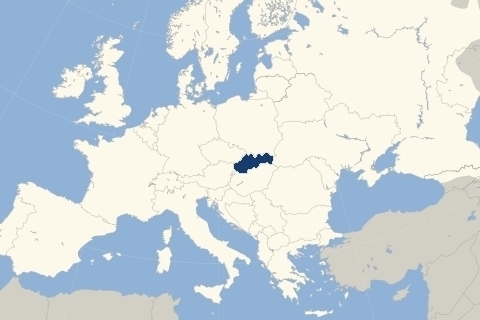 Slovakia is a landlocked country and fully enclosed by 5 neighbours: on the west by the Czech Republic (Prague) and Austria (Vienna), on the north by Poland (Warsaw), on the east by Ukraine (Kiev) and by Hungary (Budapest) on the south. The territory of 49,035 square kilometres is divided into 8 large regions and 79 smaller districts/counties. Each of the 8 so-called Higher-Tier or Upper-Tier Territorial Units (VÚC – Vyššie Územné Celky) are named after the largest city in that region: Bratislava (no. 1 on the map below), Košice (8), Banská Bystrica (6), Žilina (5), Trenčín (3), Trnava (2), Nitra (4), Prešov (7). Some of Slovakia’s enjoyable towns are small villages that are worth visiting for a day or part of a day, because of one or two outstanding attractions or because of a charming combination of a church, castle and a well-preserved central square. Others are great urban centers, places to stay for several days to savor a wide range of historic and contemporary cultural treats, and to use as a base for exploring nearby villages, spas, caves and national parks. Slovakia has a population of 5.4 million. Bratislava with 430,000 inhabitants is the largest city and the capital at the same time. Ethnicity is mainly Slovak (86%). There is a large Hungarian minority (10%) in the South of Slovakia, the second largest ethnic group is Romany (2%, the exact percentage can differ a lot between sources depending on the measurements, because many Romas subscribe themselves to other minorities, mostly Hungarian) and the third group are Czechs (1%). Rusyn, Ukrainian, Russian, German, Polish and others have less than 2% alltogether. 87% of the population are believers and most of them (69% of the population) belong to Roman Catholic church. Other religions have only small shares – Lutherans (6.9%), Greek Catholics (4.1%), Protestant Reformers (2.0%) and Orthodox Church (0.9%). Despite the modern European economy and society, Slovakia has a significant rural element. About 45% of Slovaks live in villages with fewer than 5000 inhabitants, and 14% in villages with fewer than 1000.